A few years ago, when my husband and I first moved into our house, our backyard was a shambles. The trees were overgrown, it was overrun with weeds, and it was simply overwhelming to me as a first time home owner. This was the first year that I made a gnome garden. It was my little piece of serenity amongst the jungle that was my yard. Flash forward a few years, and our backyard looks pretty good. Sure, it still has its spots where lawn refuses to grow, and weeding is a never-ending project, but it's definitely manageable, perhaps even lovely. I decided this would be the year that I would make another gnome garden, or fairy garden, whichever you prefer. I prefer gnomes. Something about them is just so cute, sweet, hard-working, and mischievous! This post is going to be more of an inspirational post, rather than a detailed how-to. Simply because its an upcycling project. I only used things that I found in my house or backyard. I didn't purchase anything new. So, the things you have may differ from mine, but this post will definitely give you some great ideas about how to make your own upcycled gnome garden. 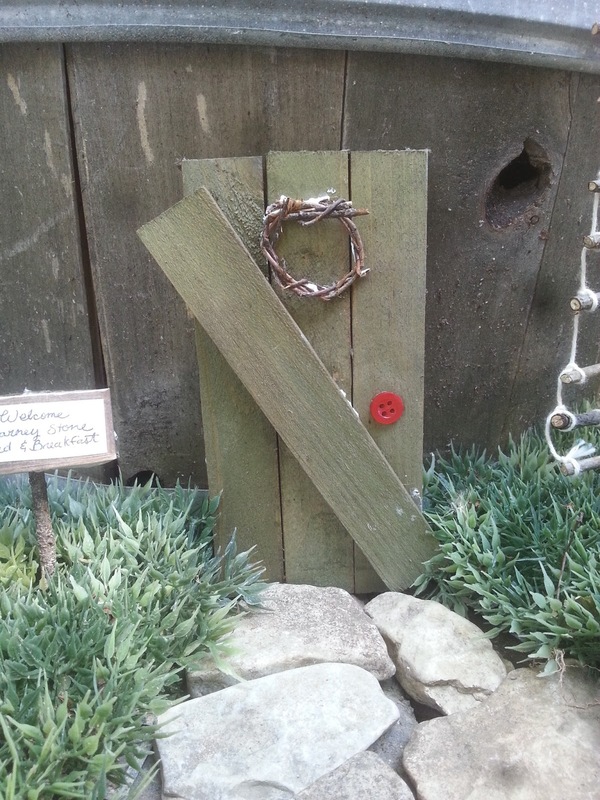 First, I had to figure out a place for my gnome garden. My first thought was at the base of my ancient elm tree. It's mossy and shaded and perfect, except for one thing, my husband and the lawn mower. I didn't want to risk having my gnome garden run over and shredded into a million tiny pieces. So instead, I decided to place it in front of my whiskey barrel and wrought iron basket planter. 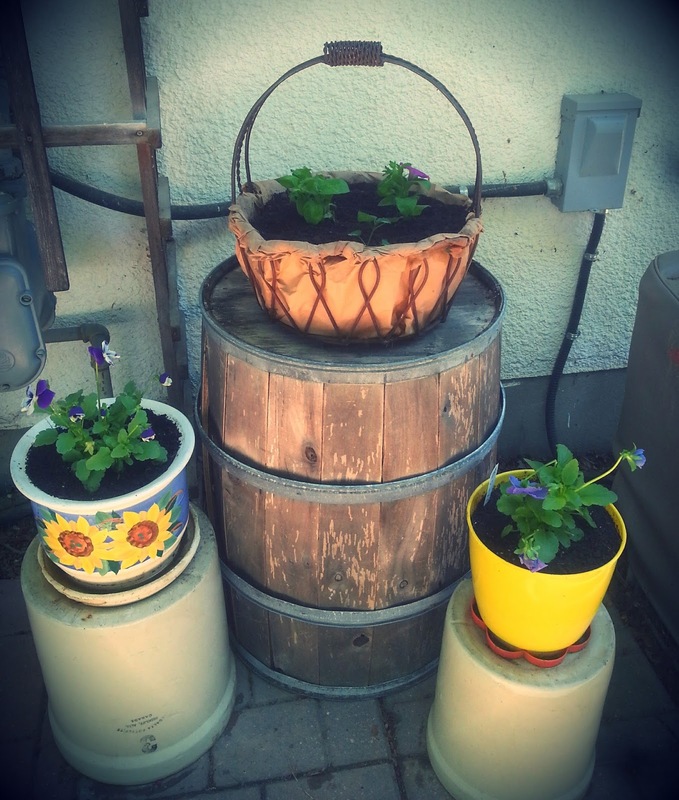 If you would like to see how I made the upcycled basket liner, click here. The first thing that I wanted to make was the door. I had an old little garden fence that I was using previously around my compost pile. All of the moisture was causing it to fall apart, so I decided to use it to make my door out of. I used white glue to glue the boards together. I glued an old button on for the doorknob. I also weaved together a very thin twig into a wreath, which I also glued to the door. In retrospect, I should have used a glue gun instead of white glue, as you can see the glue peeking out in spots. Next, I wanted some sort of ground covering. I decided to use the faux grass that I had used previously in my gnome garden that I made a few years ago. In front of the door, I placed some flat stones that I found to make a cobblestone appearance. 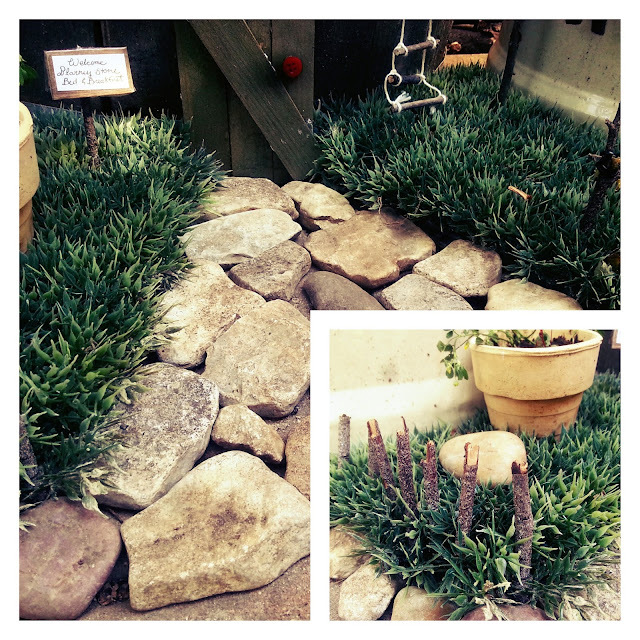 I also placed some smaller stones along the front of the grass. I broke some twigs into equal size pieces to make a fence, which I just then stuck into the grass. I placed a nice shiny stone that I found in the grass for decoration. I also made a sign out of cardboard, paper, pen, and tape, which I then taped to a twig and stuck into the grass. What's a gnome garden without flowers? 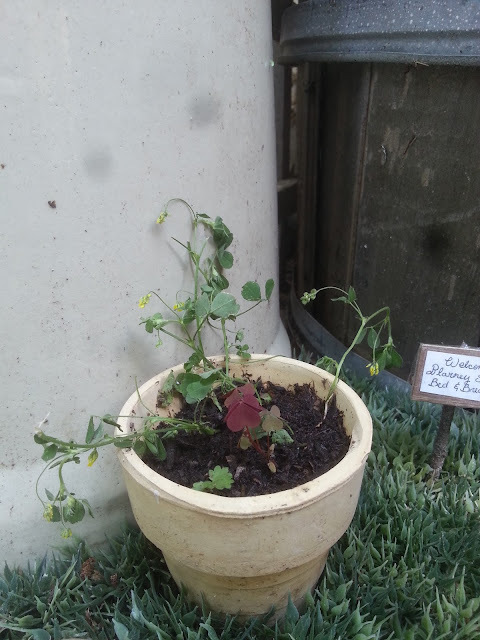 Gnomes are very small, so I used a very tiny pot that I found in my shed and planted 3 different types of tiny clover that I found growing in my lawn. I do apologize for the wilted appearance. It's 90 degrees in the shade today. They will perk up again once the sun goes down. The whiskey barrel has a hole in it that looks like a window. I wanted to make a miniature rope ladder leading from the grass, up to the window. I did so by cutting several twigs all the same length, and then simply tying them together with some kitchen string. Gnomes don't have electric washing machines, so they needed to have somewhere to hang their clothes after wash day. 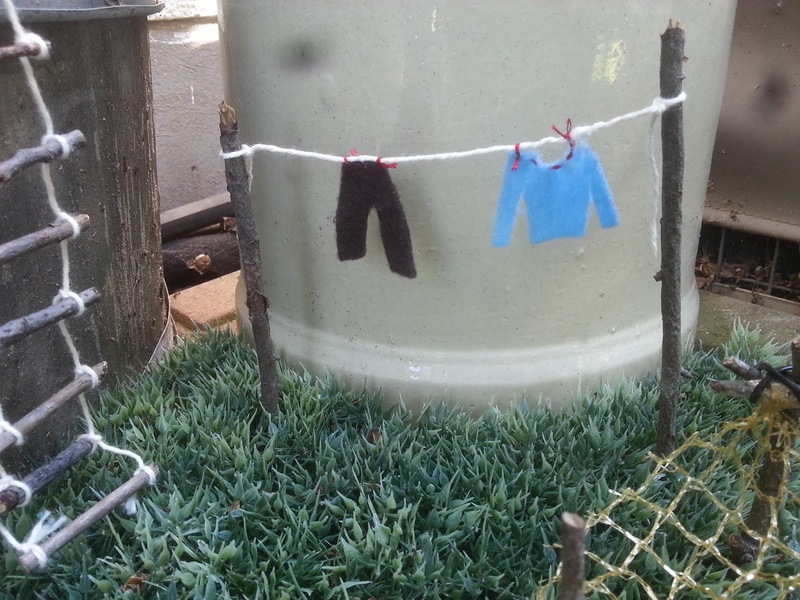 Using 2 sticks and a piece of kitchen twine, I created a miniature clothesline. To the line, I affixed a shirt and pants that I cut out of some leftover felt. 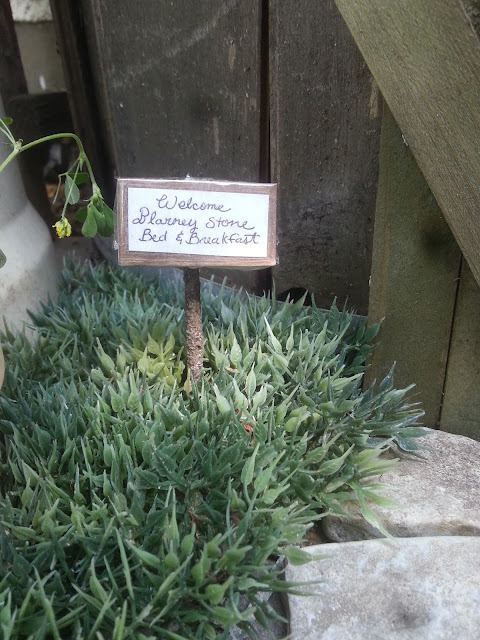 That leaves only one piece of my gnome garden to explain. 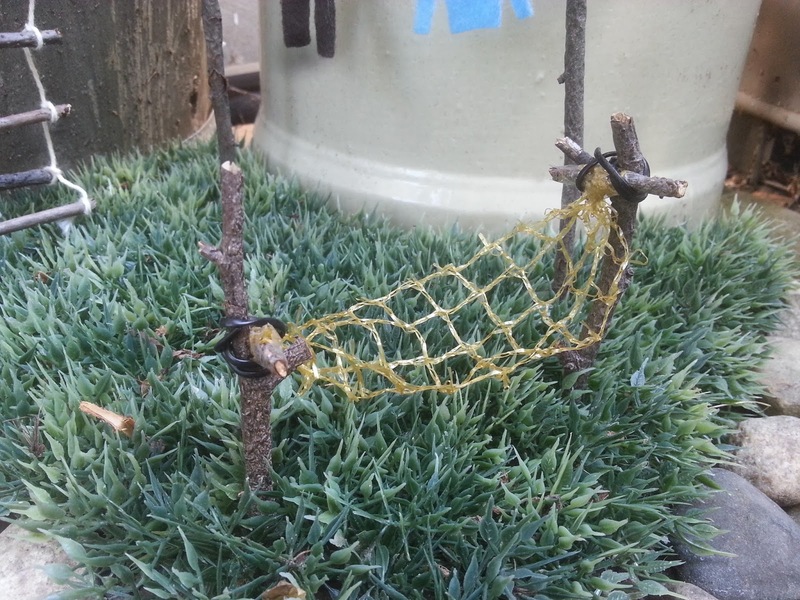 The miniature hammock. This was the most difficult part of the whole project. On my first attempt, I tried to create a hammock out of brown paper. That didn't work out so well. I decided then to make one out of the plastic netting that onions come in from the grocery store. Sometimes oranges come in this type of packaging as well. 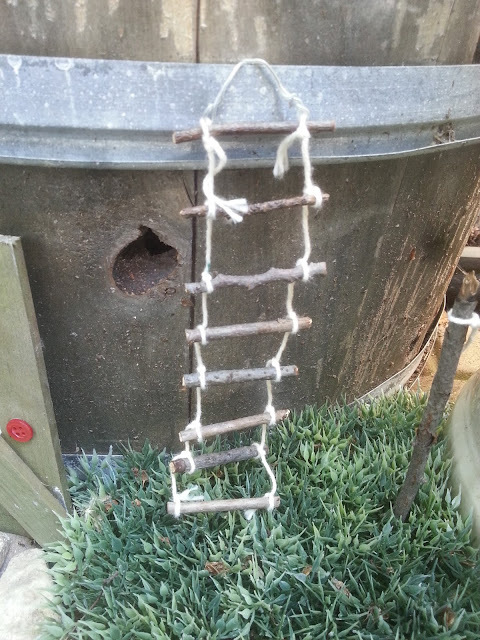 I simply cut a length of the netting and then taped it to 2 short pieces of twig, then I used an old twist tie to attach the twigs to 2 small sticks, which I then inserted into the grass. And there you have it. 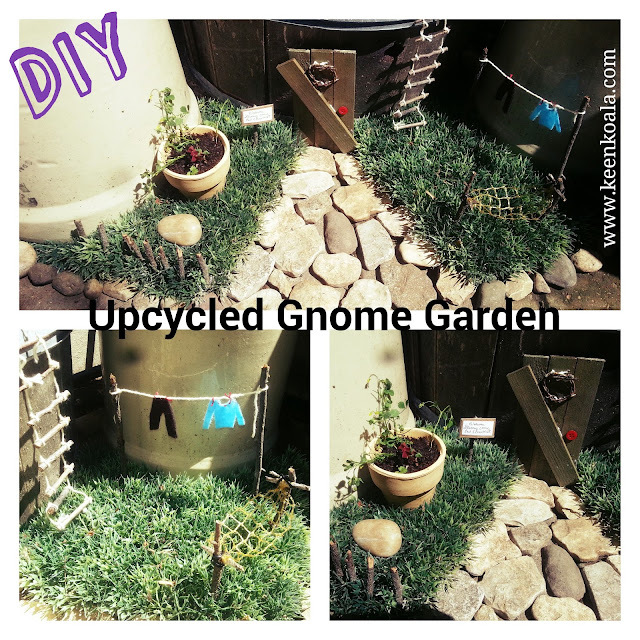 An adorable gnome garden without spending a dime! I hope you enjoyed this inspirational post. 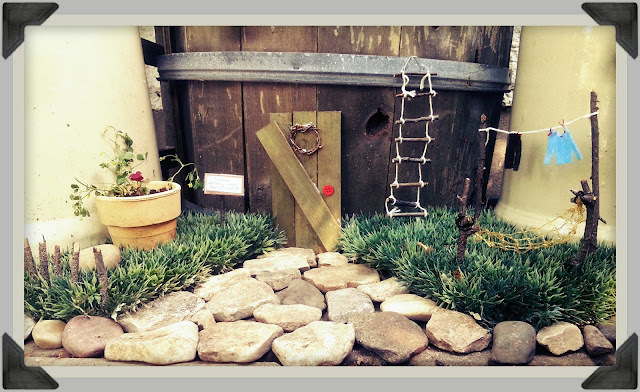 Did you make a fairy garden or gnome garden this summer? Tell me about it. I would love to hear from you.